Real-time DVB-C2 analyzer software with advanced RF measurements in detailed graphs and displaying of all C2 signaling information. Features single-PLP and multi-PLP reception and output over IP. Multi-standard cable/terrestrial receiver for PCIe with Atsc3Xpert, C2Xpert, T2Xpert. Multi-standard cable/terrestrial receiver for PCIe with Atsc3Xpert, C2Xpert, T2Xpert and StreamXpert 2.1 stream analyzer software. Advanced analyzer that demodulates and decodes all parts of a DVB-C2 signal, for use with a DTA-2131 Software-Defined-Radio (SDR) receiver card. Shows all C2 parameters, signal details and RF measurements in a concise user interface. Gathers statistics about number of LDPC iterations required to correct all errors and displays LDPC iterations history in a graph. 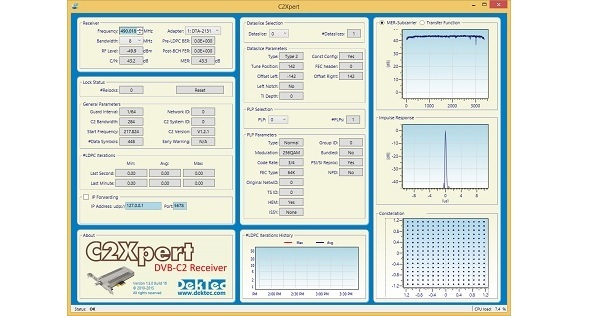 General-purpose DVB-C2 receiver and analyzer for R&D in the lab or in the field. Checking all aspects of DVB-C2 signals, e.g. for validating DVB-C2 modulators. Teaching, showing several constellations, the effect of multi-path echo's, etc. 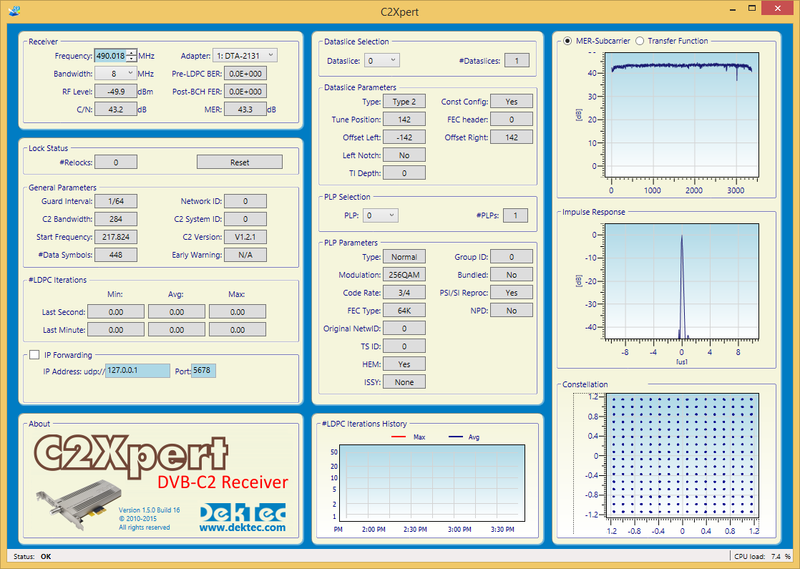 C2Xpress is a flexible DVB-C2 signal generator capable of generating almost any C2-compliant signal. Real-time analyzer for ATSC 3.0.